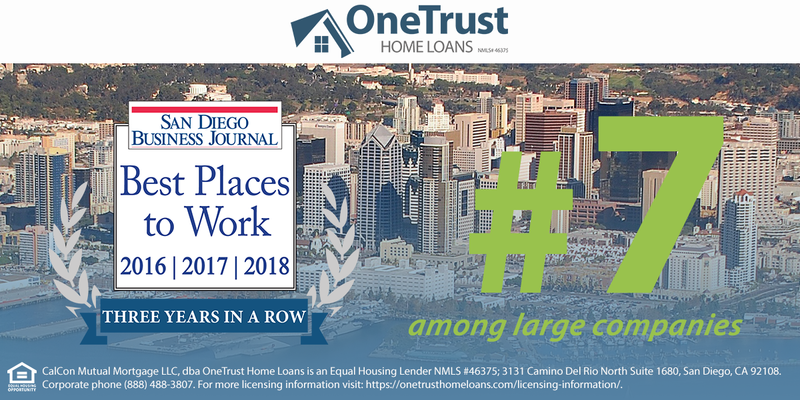 San Diego, CA – OneTrust Home Loans, a leading mortgage lender headquartered in San Diego, CA, has been recognized as one of the San Diego Business Journal’s 2018 Best Places to Work for the third year in a row, ranking #7 in the large companies category. Every year, the San Diego Business Journal publishes a list of companies that are dedicated to providing a great workplace for their employees. ‘Best Places to Work’ winners prioritize best practices including rewarding hard-working employees, investing in employee training, engaging in the wellness and health of employees, providing opportunities for team building, and more. Find more information on the Best Places to Work in San Diego program here. OneTrust Home Loans is a privately-owned direct lender and servicer with sales and operations across the country. OneTrust’s model is similar to a bank, using its own capital to build its balance sheet of quality, sensible, loans in addition to the standard loan options, including Conventional, FHA, VA, USDA, Jumbo and more. OneTrust Home Loans places special importance on customer service as evidenced by their tagline, Service is Everything!® For additional information visit www.OneTrustHomeLoans.com.